Boulder has long been known for its collection of eclectic restaurants, offering up an immense variety of ethnic cuisine. Recently, a new eatery has been added to the mix. Sforno Trattoria Romana is one of Boulder’s newest restaurants. 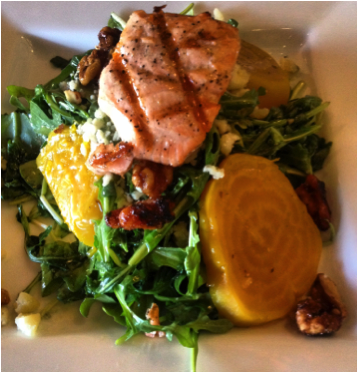 It features locally sourced, organic, Italian and Mediterranean fare, created with love, passion, and zeal. Nestled in the downtown scene, amongst some of Boulder’s most distinguished restaurants, Sforno is ready to compete, and they’ve got a killer menu to prove it. Open seven days a week, the menu offers intriguing items like octopus and ahi tuna, as well as traditional Italian dishes, such as gnocchi and lasagna. Sforno is the brainchild of executive chefs Marco Monnanni and Beau Raffensperger. Marco is the owner of Bacco Boulder, Bacco Ristorante & Pizzeria in Fort Collins, as well as Parma Trattoria in Louisville. Leslie Young, another co-owner of Sforno, is also a co-owner of Bacco Boulder and Bacco Ristorante & Pizzeria. Needless to say, they’ve got plenty of experience under their belts. Their vision was simple: home cooked Italian food that makes your taste buds sing and your heart warm up. We think they’ve nailed it. The rustic décor, coupled with their homemade mozzarella and wine selection, are enough to make you feel as though you’ve left Boulder and traveled to a quaint Italian village. The wood fired pizzas simply cannot be matched, and will have you coming back time and time again. Let’s face it, how can a wood-fired pizza, topped with artichokes, mushrooms, prosciutto and a farm raised egg, not make your mouth water? Regardless of your culinary preference – be it omnivore, vegetarian, vegan, or even gluten free – Sforno will have a dish for you. The salads, for instance, are simply divine. The Sforno and the Rapa are two of my personal favorites. Their avocado bruschetta is another fantastic vegetarian option. 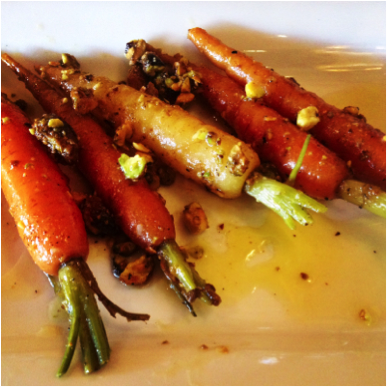 And, you can’t leave this restaurant without trying their roasted carrots with candied pistachios – it’s unlike anything you’ve ever tried. If you’re a meat lover, then you’ll probably go crazy over their lamb chops and buffalo shank. Aside from its rustic allure and culinary craft, the staff at Sforno is some of the friendliest and most welcoming in town. For someone who spent a lot of time in the industry, I can tell you that the service will make or break a restaurant. At Sforno, the staff goes above and beyond to make you feel at home. Their knowledge is astonishing and will leave you impressed, to say the least. 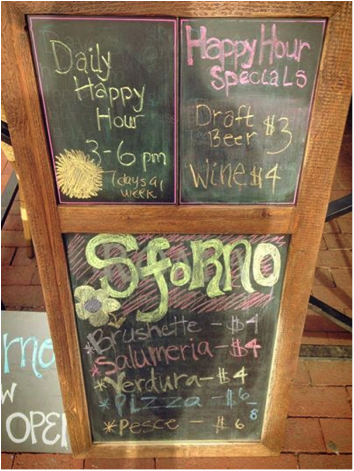 Along with being open every day of the week, Sforno also offers up a pretty great happy hour, which runs from 3-6pm daily. You can snag great deals, like $3 drafts and $4 glasses of wine. Traditional Italian items are also on special, which means you can enjoy a homemade bruschetta or salumeria for just $4. Sforno may be new to Boulder, but it’s already packing a mighty punch. Its location – 13th and Pearl – makes it an ideal restaurant for downtown employees to enjoy lunch. With happy hour seven days a week, we can expect this Italian delight to be pretty packed in the afternoons. Of all the new restaurants popping up, this is one you simply can’t ignore.